Malik was arrested in a late night raid on 22 February from his Maisuma residence and taken to the Kothibagh Police Station. The Centre on Friday banned the Jammu and Kashmir Liberation Front (JKLF) led by Muhammad Yasin Malik. The Central government has today declared Jammu Kashmir Liberation Front (Yasin Malik faction) as unlawful association under Unlawful Activities (Prevention) Act, 1967,” Union Home Secretary Rajiv Gauba said. “This is in accordance with policy of zero tolerance against terrorism followed by government,” he added. “Yasin Malik was the mastermind behind purging of Kashmiri Pandits from the Kashmir Valley and was responsible for their genocide,” he said. Malik is presently under detention in Kot Balwal Jail in Jammu. Gauba said that the Malik’s JKLF spearheaded the separatist ideology in the valley and it has been at the forefront of separatist activities and violence since 1988. The Home Secretary said that 37 FIRs have been registered by Jammu and Kashmir Police against JKLF. “Two cases, including the case of murder of IAF personnel, were registered by CBI. National Investigation Agency (NIA) has also registered a case which is under investigation,” he told the media. Gauba also said that the security of many separatists was withdrawn following a review, which will continue. “A large number of secessionist leaders were being provided security by the state, this matter has been reviewed. And after review, security of many such persons has been withdrawn and this process of review will continue further,” he said. The National Investigation Agency (NIA) officers had also raided Malik’s Srinagar residence on 26 February. He was later shifted to Kot Bhalwal jail where the founder of Jaish-e-Mohammad (JeM) terrorist outfit Masood Azhar was lodged before being released in 1999 in exchange of the passengers of the IC-814 flight that was hijacked to Kandahar. 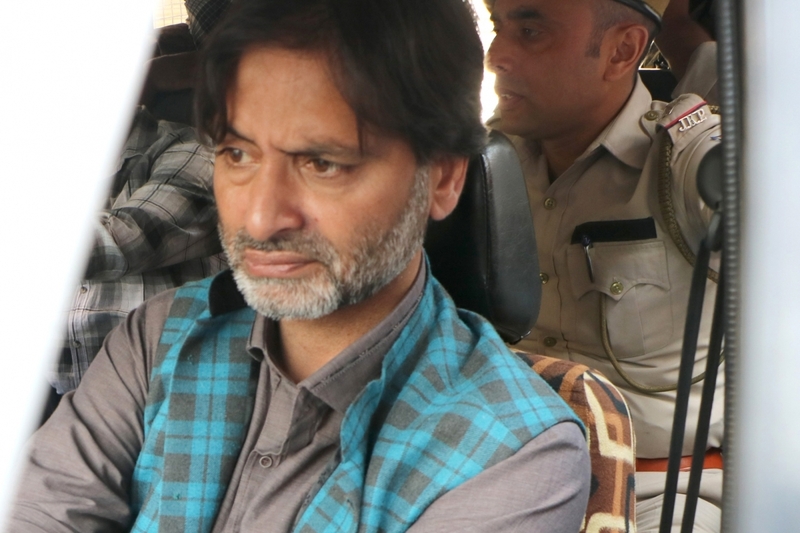 The CBI had recently filed a petition in the state high court seeking transfer of cases against Malik to Jammu from Srinagar. The cases relating to the alleged kidnapping of Rubaiya Sayeed, daughter of the then Home Minister Mufti Mohammed Sayeed and sister of Mehbooba Mufti, and killing of five IAF personnel in 1990 are pending for the past 29 years. Malik is also accused of killing sessions judge Neelkanth Ganju who had awarded death sentence to JKLF terrorist Maqbool Bhat. The JKLF is the state’s oldest separatist group having been active since the early days of militancy. Earlier, the Centre banned the Jamaat-e-Islami group.